In my reading, Bernhard Schlink is now 2 for 2. 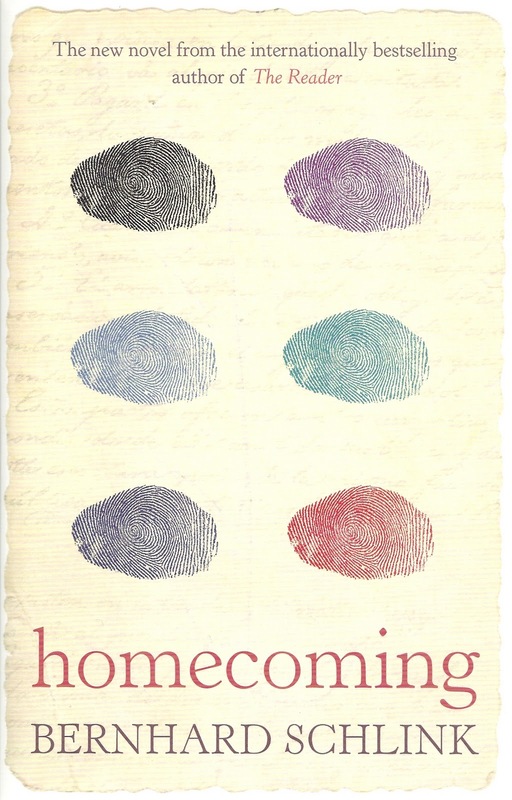 I thought The Reader was amazing, and while I don’t think the plot of Homecoming is as tight as The Reader, it is still a compelling, well-written novel that encouraged all the appropriate emotional reactions. And like The Reader, Homecoming deals with the Nazi legacy in Germany. Regular folks trying to deal with (or forget about) their individual or collective culpability in genocide. Unlike The Reader, however, Homecoming takes a more philosophical look at good and evil and never really broaches the details of Nazi barbarism explicitly. I am tempted to say that Schlink writes historical and legal fiction, but I am not sure if his work would really fit into those genre. It seems too readable for that. His writing is never pedantic nor pedagogical. The points of history or law introduced into his novels are expertly woven into the emotional, relationship-oriented drama. His characters and their motivations, while sometimes alien to the reader, are wholly believable. And you find yourself caring quite a bit about the characters. As I mentioned earlier, the plot in Homecoming wasn’t as tight as it could have been. There are a few twists and turns that are too pat. And there are others that seemed rather clumsy. Like Schlink had too much he wanted to say. Still, there is nothing in this criticism that should keep you from reading Homecoming. There is much here that makes you think, and perhaps more importantly for a novel, makes you feel. I also loved The Reader, and enjoyed this one though I agree with you about it not being as tight as The Reader was. But I worry that both books go too far in the direction of excusing the perpetrators. This was not a big problem for The Reader, though by the end the audience feels sorry for a woman who committed mass murder to cover her own shame. Okay, that sounds like a big problem. I read Homecoming when it first came out, so I may be recalling the details incorrectly, but by the end of it I felt the father character, (I think I have that right) and his experiments were being used by the author to explain away or humanize the actions of horrible criminals. I felt Mr. Schlink's message was heading towards “You would have done the same if you'd been in their shoes” which may be true or not, but is still making an excuse, making us feel sorry for the perpetrators. I felt this was a much bigger issue with Homecoming than it was with The Reader. This is one point where I really wish book bloggers could hold 'meet-ups' because I'd love to hash this issue out with someone who has read both books. Also loved The Reader, and as you know because you were there when I bought it, I have this one in my tbr stack. You have pushed me a little closer to reading it. And absolutely agree about Kate Winslet. Intrigued by C.B. James comment about excusing the perpetrators. I found that I did not feel so sorry for the perpetrator in The Reader as I felt the emptiness rendered by her actions. Found myself wondering if Schlink was trying to point to the questions of whether or not inhumane crimes empty one emotionally or certain absences in self leave one more inclined to commit such acts. An innate disconnect from humanity in a way. Hmm. Now I want to read this one to see how this plays out. I hadn't heard of this book but it sounds fascinating — I love books about books. I completely agree about the adaptation of The Reader. Kate Winslet was great but one thing that did bother me was how little I heard about David Kross who played the young Michael Berg in the film. I thought he was so good and yet I never heard about him getting any awards or nominations. He was the whole film and he was so wonderful. I read and reviewed The Reader a few years back; I had the complete opposite reaction to you! I HATED it – thought it was trite and overly simplistic and kind of foolish; I also didn't care for the writing. I think I would like to see the movie, but I don't think I'll be reading anything else by Schlink! CB: I agree with you that this one would be great to discuss in real time. I think the sympathy we may feel for Hannah in The Reader illustrates the “banality of evil”. That everyday folk are capable of evil without losing a whole lot of sleep. I saw a film about collectors at the Chelsea Flea Market in NY. In that film one Jewish man collected photos of Nazis in uniform in the type of photos that we all have in our photo albums. Birthdays, weddings, christenings and other every ho-hum everyday situation. He referred to them as depicting the banality of evil. And I am a bit fuzzy on the details but I don't remember Hannah's role in the mass murder was a result of her shame. I thought the outcome of the trial against her was a result of her shame (over being illiterate). I also think that some of the sympathy comes from the fact that Hannah's ignorance is particularly sad given how the other “smarter” perpetrators of the same crime just know how to lie better. I must admit most of my memory comes from the film and not the book. It makes me want to re-read it. In Homecoming even taking the “you would have done the same thing” approach doesn't let anyone off the hook. Think about how complacent we are with genocide when our own lives aren't in danger. Amercia was late getting into WWII even when our leaders knew what was going on. We turned away ships full of refugees. Today we kind of care about places like Rwanda and The Sudan, but not enough that we forces any kind of real action by our leaders. If we can't act humanely when our own lives aren't in danger, how would most of act if our lives were in danger? What I like about Schlink's work is that there is not a simple answer to anything. Even the most horrible things can't be explained in black and white. Frances: I too am intrigued by CB's comments and wish we could all sit around and talk about these two books. I think your notion about certain absences in self is worth exploring. For instance why did I get so emotional at the end of Dead Man Walking (film)? He committed horrible crimes yet I still sobbed like a baby when they executed him. Why my sympathetic response? Sadness over the fraility and stupidity of humanity? Karen: David Cross was great in the film, I agree. Aarti: I think age could definitely play a role in how one views Schlink's work. Steph: His work is by no means without controversy, so I can understand a strong reaction against. As I mentioned earlier I am intersted in re-reading The Reader. Sometimes on a first read I react emotionally and forgive literary shortcomings. I also thought The Reader was nicely done. When I saw the name David Kross, my mind immediately went to David Cross of Arrested Development. It was a confusing moment.